GARY, Ind. 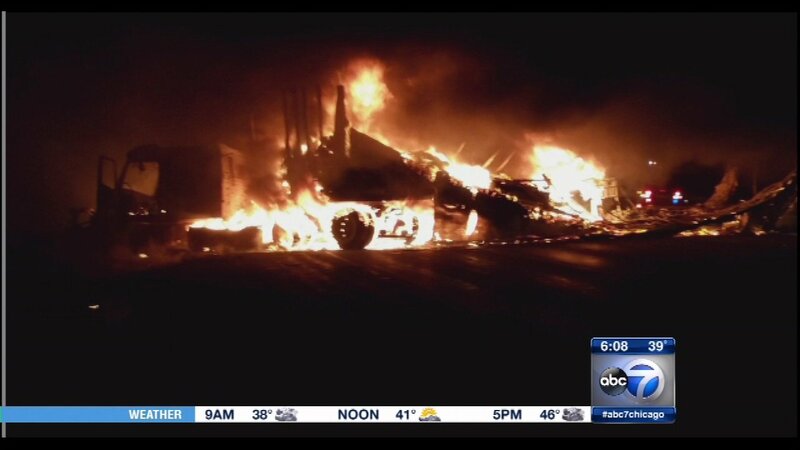 (WLS) -- A truck fire closed all lanes of westbound I-80/94 between Broadway and Burr for nearly five hours early Tuesday morning, snarling traffic in northwest Indiana. Indiana State Police said a semi hit a crash cushion and a cement pillar about a mile west of the Grant Street exit just before 1:10 a.m. Tuesday. The truck went airborne and came to rest across the right, right middle and left middle lanes under the Chase Street overpass. Then it burst into flames. The driver was able to escape before the vehicle was fully engulfed and was not injured, state police said. Both the semi and the trailer were a "total loss." The truck was hauling auto parts. A truck fire closed all lanes of westbound I-80/94 between Broadway and Burr early Tuesday morning. Drivers encountered massive traffic delays as they tried to get around the crash site. Two left lanes and the left shoulder of westbound I-80/94 re-opened at Chase Street around 6:40 a.m. The right two lanes will remain closed for clean-up for the truck, its load and the road. It is unknown when those lanes will reopen. There are long delays and back-ups on I-80.94 and also on I-65. Indiana police urge drivers to use alternate routes, including the Indiana Toll Road, US 30, US 20 and US 6/Ridge Road.